Today is the 70th Anniversary of Anne Frank's arrest (along with her family) after 25 months of hiding. 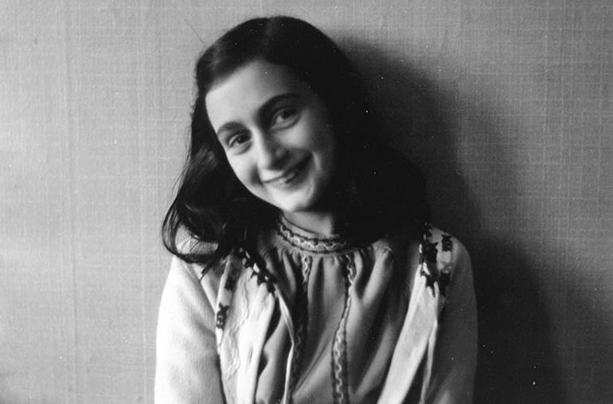 In this photo, taken sometime in 1941, Ann Frank was about 12 years old. She has all the components of a sincere smile, albeit with a slight suppression. An important component of a true, joy-felt smile is that her forehead is relaxed (no muscle contraction). This required for a sincere smile. It's also very crucial to take note of Anne's eyes - they are both partially closed along with temporary concave-up furrows in her lower eyelids. Many expressions are falsely labeled as (or falsely believed) to be "smiles" - yet if they do not have these two crucial eye components of joy-happiness, the expression cannot be a sincere (Duchenne) smile. You will see that only Anne's upper teeth are showing. While the lower teeth may be seen during sincere laughter (or transitioning to or from sincere laughter), unless there is a favorable angle (e.g. a tall person standing next to a short person) or if fatigue has set in (posing too long) - the lower teeth should not be visible if the smile is sincere. Although the corners of her mouth are pulled outward (laterally) there is a very significant upward vectoring of the cheek muscles - which works in concert with the eyelids to help form the lower lid furrows. The mouth component of Anne's smile is slightly suppressed (what clue do you see for this suppression?). In addition, in this image, Anne is tilting her neck laterally. This conveys a high level of emotional comfort and a significant degree of affection for whoever is present. When a person tilts their neck clustered together with a sincere smile, they are "letting down their filter". It signals they are comfortable displaying an affectionate-vulnerability (Do not confuse this with the kind of vulnerability one feels in the presence of fear. The neck is never tilted in this manner when a person is fearful.). Thank you Anne. You will always be a heroine and an inspiration. Nonverbal Communication Analysis No. 2906: President Obama, "... We Tortured Some Folks ..."